Last minute: Quick and easy DIY for a spooky Halloween front door. For the record, Halloween is not a Norwegian or European tradition so we don't do a lot around it. ​Kids have been very keen though: they are looking forward to unlimited access to candies! However, some people don't feel connected to the tradition and don't wish hordes of kids knocking at their door. To make it easier for the children to know where they can "treat or trick", a "rule" has been followed the last years: they can go to the houses which have a lighted porch and any kind of Halloween decoration, it could be a single pumpkin or more. All you need is a sheet of paper, a garbage bag, black craft cards, scissors, and double sided tape. I folded the paper sheet in the middle and draw one half of a bat. Clip and unfold. You have a perfectly symetrical bat! Use this as a template on your garbage bag and cut out the number of copies you want. I repeated the same process on black craft cards that I had on hand. At that point, I decided to add eyes to the bats. I would skip that for the garbage bag bat (repeat that 3 times, please!) unless you have a better glue than mine (the eyes fall down as soon as I placed them on the door). I punched a hole in the tail of the cards' bats, and pulled a thread through it. I stuck double sided tape on the back side of the garbage bag bats. Now, the cards' bats are ready to be hung under the porch's roof and the garbage bag bats to be put on the front door. I love how the bats are flying like crazy in the wind. I do love pumpkins, they are yummy and very decorative, but I like a good challenge and decided to collect decoration ideas for autumn that don't include pumpkins. I am like that. The browns, greens, oranges and reds are screaming autumn all the way. They are warm hues which are so very welcomed in darker days. The best of all is that you can find your decoration right at your door, in your backyard or during a Sunday walk! Simply fill in pretty hurricanes with leaves or chilli! How beautiful are these colourful felted acorns? Are you decorating your home for autumn and will you manage to keep away from pumpkins? Say good-bye to your boring garage door! Welcome to this site if you are new here, and thank you to the ones who are coming back! Today's post was inspired by this fabulous house and its amazing garage door. Decorative hardware is an easy and quick way to upgrade a boring garage door. If you are after a carriage house style, you can even add faux windows! However, I have never seen that in real life and I don't know if it looks fake or not. These dressed-up garage doors have a totally different style from the one in the first photograph (obviously), but they got very pretty after a quick and inexpensive make-over. I will keep dreaming about a glass garage-door and be happy about not having to take care of the clutter in the garage! I am helping my aunt, who is living in France, to redecorate her living-room and dining-room. When she sent me a picture of her credenza, with two lonely lamps on the top of it, I thought that I should give her a tip or two about the styling. 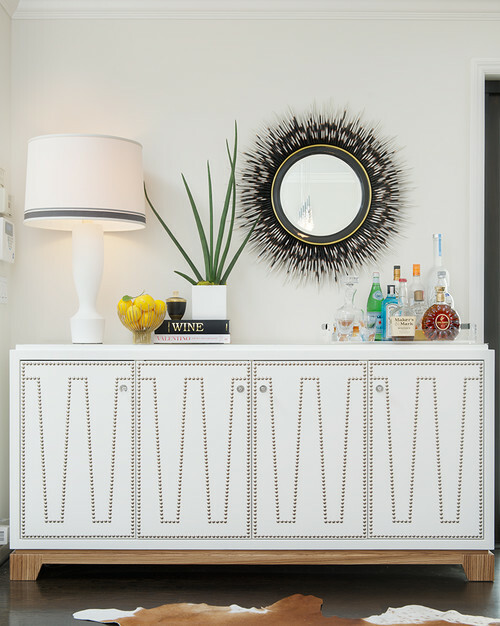 After a quick look at my own credenza, I immediately knew that I needed to do something about it and share it! There are no rules to follow, but I think that it is helpful to have some guidelines to achieve a balanced visual look. Well, thanks a lot, but how to arrange them? To be honest, it is not easy to find the right balance: lamp on the left side... or is it better on the right side? Let's put two lamps then! Oh wait, I don't have two lamps. A vase on the stack of books? Well, almost no one will get it after only one attempt. Shop in your own home, see what you can use and get creative. Just keep in mind that balance is the key word. In the picture below, the group of bottles (which is visually heavy) is balanced out by the lamp and the plant; however, the off-centre mirror balances perfectly the height of the lamp and the plant. For a more minimalist look, replace the lamp(s) by a single hanging bulb or candles, accessorize with unexpected details, graphic art and keep everything in a neutral palette. Do you have any particular trick for styling a credenza?